Human beings are on an evolutionary arc, progressing individually and as a species toward a ‘self-actualized’ fulfillment of our unique nature. With all the criticisms I have already directed against the personal ego – that conceited blowhard who craves validation, praise, glory, and immortality – it might come as a surprise for me to acknowledge it as the legitimate center around and in relation to which the whole project turns. Cloud beings, tree beings, dog beings, monkey beings: all of these are distinct manifestations (cloud, tree, dog, monkey) of a single mystery (being). But none of them have created religions designed to awaken and elevate their own deeper natures, to leverage their evolutionary leaps into higher modes of life and contemplate their communion with the universe. The haven’t because they can’t, and they can’t because they lack a separate center of personal identity from which such a grand perspective might be taken and such a magnificent program of self-transformation conceived. They lack egos. As far as we know, only human beings have egos. My main issue with the ego has to do with its habit of hijacking our individual development and evolution as a species, pulling it off course into a tangled thicket of odd fixations. Even religion has gotten recruited into its service, idealizing our tendencies toward pettiness, vanity, judgmentalism, and out-group aggression in a deified image of ourselves. As religion degenerates into a hierarchical system of social control, it ceases to function as a program for the transformation of human beings into self-responsible creative agents. Especially in its absolutist theistic forms, religion is rightfully rejected as a sick and dangerous fever of neurotic self-obsession. These arrests and setbacks in the development of ego and its religion do not warrant our blanket condemnation of them, however. Indeed if my general theory is correct, then the dismissal or termination of ego (and its religion) runs the risk of subverting the larger project of human fulfillment. To the degree that we are successful in eliminating them (convinced we are finally progressing beyond them), the absence of ego and its religion could bring our career as a species to an unhappy end. 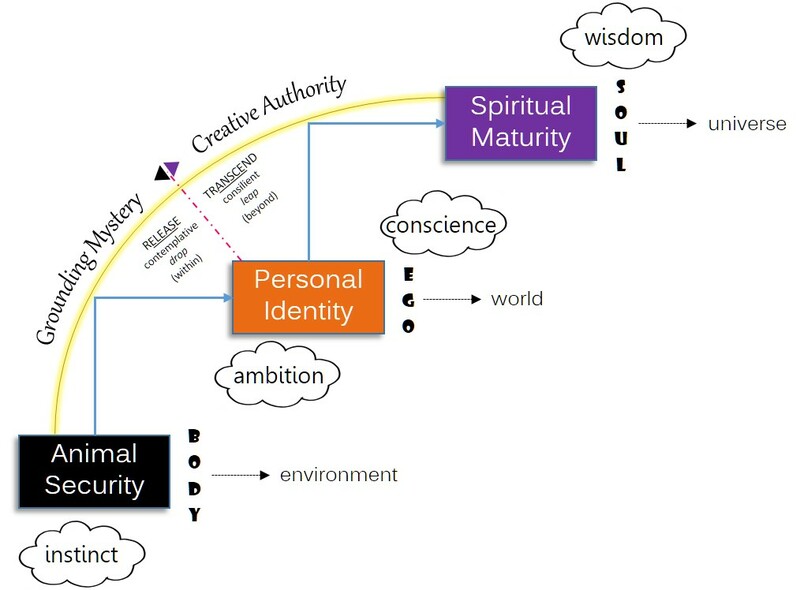 Directing your attention to my diagram above, let’s keep our eyes on that feature in the middle labeled ‘personal identity’. Rather than being the perfection and end-all of our development as individuals, the achievement of a separate center of identity (ego with its personal world) is really a middle stage between an animal prehistory submerged in instinct and a spiritual higher state awakened in wisdom. As Freud helped us see, ego management is a rather tense affair, as the individual tries to balance the ambition of ‘me and mine’ against the conscience of a tribal ‘us and ours’. Somewhere in that tension the individual ego needs to maintain membership (as ‘one of us’) while also honoring the inner promptings of the higher self. If a tribe supports the emergence of creative authority in the individual, then a transformative breakthrough of this order will be encouraged and celebrated, rather than condemned as it often is in repressive social systems. This is typically where that deified superego of the tribal deity is used by the group to denounce, quash, and uproot the ‘sin’ of vainglorious self-regard – a character trait which, oddly enough, is protected as belonging by exclusive rights to the deity. But the ego brings its own resistance to the project of human transformation. A good number of those ambitions are formed around the drive for security, a frequency of nervous state that correlates to an environment perceived as safe and supportive. Because none of us gets through infancy and early childhood without some insecurity, our focus gets set on attaching ourselves to those anchors and sources of security that will keep things from falling apart. As we go, we construct our web of personal meaning (i.e., our world) around these anchors and sources, incorporating them into our identity and way of life. It’s no wonder, then, that what I earlier called the inner promptings of our higher self, to break through the attachments that comprise for us the emotional structure of reality, might be strenuously resisted by the ego. To the degree that animal security finds significant compensation in personal identity, further progress of development into spiritual maturity will be felt as heading in exactly the wrong direction. Such a ‘breakthrough’ would be tantamount to a ‘breakdown’ of security, control, order, and meaning – the very death of ego! One strategy often used in justifying ego’s resistance involves lampooning spiritual maturity as not only heretical, but as also a blatant refusal of personal responsibility. 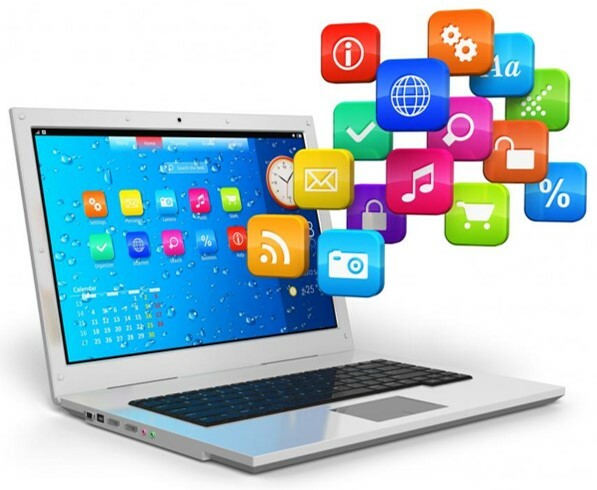 For ego to maintain membership in the social system of attachments, an individual needs to uphold certain moral obligations and subordinate his or her own needs to the will of the group. Any sign of the individual’s loosening allegiance to tribal rules and orthodoxy – asking too many of the wrong questions, expressing doubts and misgivings, pushing on boundaries or challenging assumptions, feeling empathy for outsiders and voicing an interest in the broader concerns of life on earth – such potential disruptions of the consensus trance are quickly discouraged as forsaking what is true, right, and good. 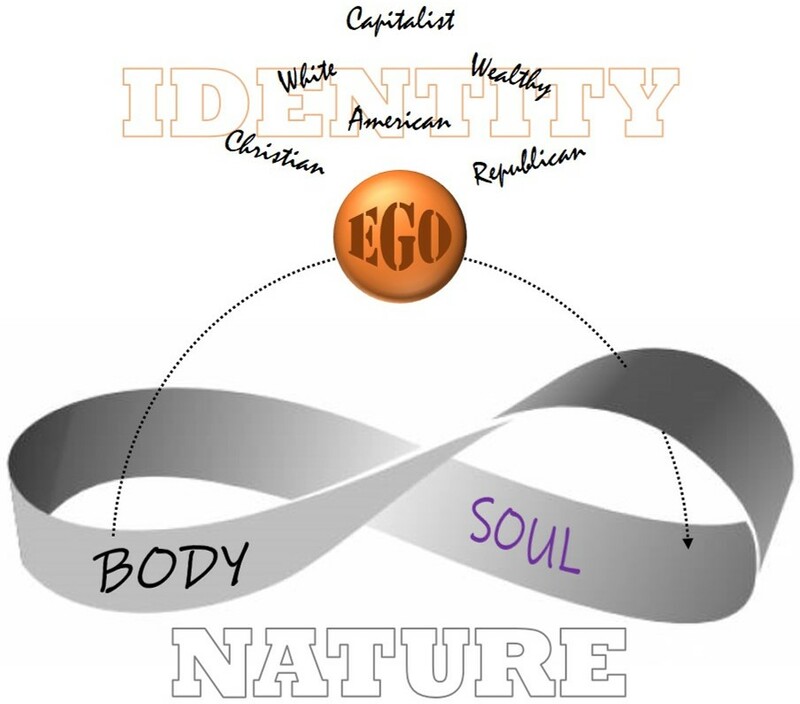 When an individual possesses sufficient ego strength (where the personality is stable, balanced, and unified) and the time is developmentally right, an access point will open from the realm of personal identity, to a mode of conscious life momentarily free from the constraints of ‘me and mine’/’us and ours’. Once the breakthrough is gained, an upward turn along the arc will involve a self-transcending leap beyond identity, while a downward turn from this same point proceeds by a self-releasing drop beneath identity. This inward-and-downward turn is also the mystical turn where consciousness sinks back contemplatively into the grounding mystery and ineffable source of our being. The upward-and-outward turn is the ethical turn where consciousness rises into our creative authority as agents of a higher wholeness, consilient leaders on the advancing wave of evolutionary change. My stair-step diagram could be interpreted as anticipating a future state of spiritual maturity where ego (that troublemaker) has been finally outgrown, discredited, and permanently left behind – along with its religion. But by now it should be clear that according to this theory ego plays a much more integral role in the longer project of human self-actualization. Even though it is purely a social construct (and substantially unreal, as the Buddha noted), the delusion of our separateness (which is a function of ego consciousness) is the very thing all higher religions provide insights and techniques for breaking through. In previous posts I have tried to make a case against such a clean separation of spirituality and religion. I’m not suggesting that a religion devoid of an active and deep spirituality is an impossibility; we see enough of that all around us. Certainly religion can lose its inspiration, its creativity, its compassion and ethical vision. At that point it becomes a perfunctory framework of rituals and stilted phrases. In my view, it is no longer really a religion. We may put that label on it, but we do so by mistake. From the Latin religare, religion is a system by which the various domains and concerns of daily life are coordinated and anchored to the grounding mystery of being. Spirituality refers to the inner experience of this grounding mystery, as well as to an awakened intention in the way it is lived out. Spirituality, then, is the living intention of a dynamic religion, while religion is the relevant extension of a vibrant spirituality. A religion can lose its spirituality and die, but spirituality requires the structural support of religion if it is to engage the concerns of daily life. My spin on religion challenges us to break out of the conventional definition, where we commonly speak of ‘the world religions’ as historical institutions organized on the cultural level. If the word merely refers to a system that coordinates and anchors our human concerns and activities to the present mystery of reality, then you have a religion, and so do I. Whether or not we affiliate ourselves with one of the institutional religions is of secondary importance to the question of how we individually (as well as communally) connect our lives to the grounding mystery and carry it consciously into all that we do. 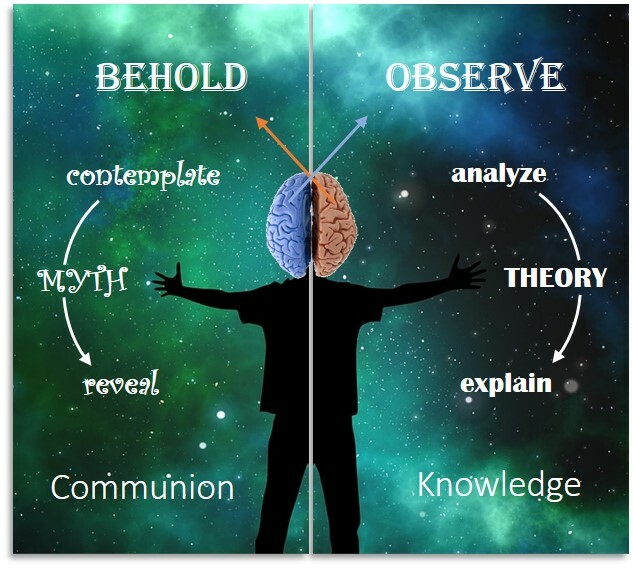 This gives me a chance to illumine the relationship between two big ideas in my Tracts blog: the grounding mystery and creative authority. 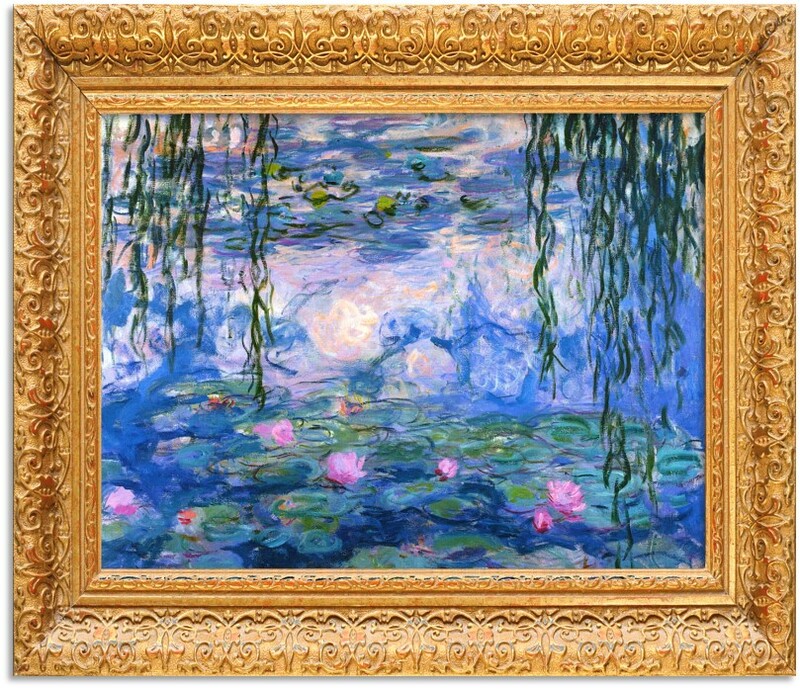 Very quickly (as if that will help), the grounding mystery is a metaphorical reference to the present mystery of reality, to the Real Presence manifesting to (and as) our awareness in this moment. Our deepest engagement with it is far below the reach of words, and this, along with the fact that it surpasses any definition our minds might attempt to throw around it, makes it universally recognized across the mystical traditions as ineffable, beyond name and form. Our only direct access to the grounding mystery is by an inward path of quiet contemplation. Outwardly we can observe its countless manifestations, its many masks; inwardly we know it as mystery, disguised as our self. This may sound very “Eastern,” but Western mysticism carries the identical realization. Simply stated, you are a human being, a human manifestation of being, an expression of the grounding mystery in human form. The wonderful thing is that each of us can contemplate and release ourselves to that deeper mystery at any moment. 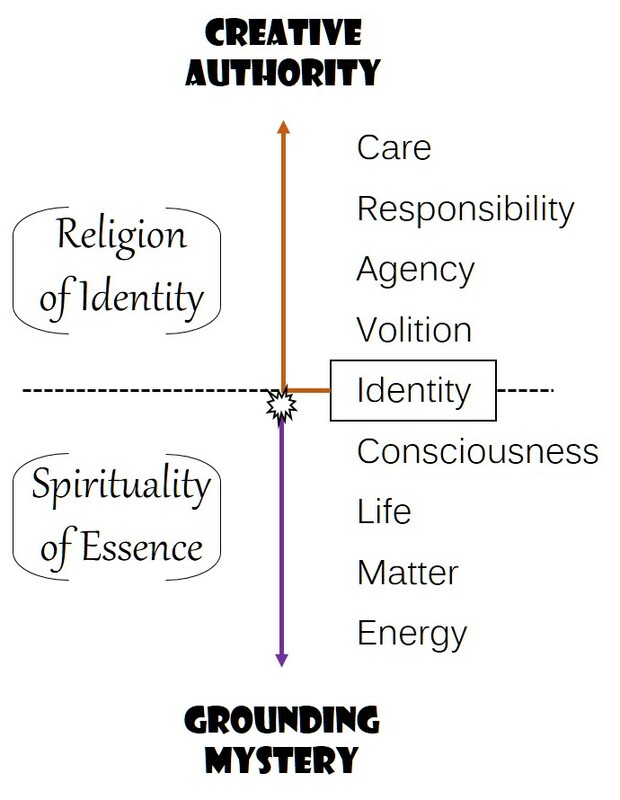 In my diagram above, I have placed identity (ego: my self: “I”) inside a list of terms that together represent a spectrum of existence ranging from the interior depths of being to the extended outreach of our individual lives in the world. Below – or rather, underneath and supporting – identity is consciousness, life, matter, and energy in descending order. Identity has its ground in consciousness, consciousness has its ground in life, life has its ground in matter, and matter has its ground in energy. The deeper we go, the more ineffable the ground becomes. We can say a lot about identity, less about consciousness, still less about life or matter, and really nothing about energy that makes any sense (even the scientists talk about its ‘spookiness’, indeterminacy, and quantum unpredictability). Despite the fact that we can’t say much about the present mystery of reality that underlies and supports identity, this is precisely where spirituality lives. We have an intuitive sense that this deeper support is ‘more real’, and when we allow our center of attention to sink to these deeper registers, we feel more present and authentic within ourselves. Still, such an inward descent requires that we let go of all those attachments and hangups that keep ego intact – and this is what makes a vibrant spirituality such a threat to religions that have lost their soul. Its communion with a mystery that cannot be named, represented, or even precisely located must be heretical because it is incomprehensible. Moving up my list from identity, we don’t release ego but rather assume it in all that follows. This is where religion comes into play. Our connections outward into daily life and relationships are necessarily personal, which is to say they involve who we are in the world (as distinct from what we are). Ultimately our individual development into maturity means that we start choosing (or willing, volition) the life we want, enacting our intentions (agency), taking responsibility in what happens, and fully investing ourselves in the process (care). This outward flow from identity to care is what I mean by ‘creative authority’. Because it is all about shaping and coordinating the adventure of identity, from the awakening of self-consciousness in infancy, through the complicated role-plays of adulthood, and into the retirement of old age, religion should support our progress to creative authority (also known as self-actualization). Too often, however, its influence attempts to move us in the opposite direction where we are pushed back into a more dependent, submissive, and obedient state. This is when our religion, now outgrown and losing relevance, begins to strangle our spirituality. While the force of our spiritual growth is oriented on the higher ideal of human fulfillment, the dead weight of our religion pulls us into frustration and futility. That’s when it is time to break through yesterday’s religion and create a new system, one that can coordinate and anchor our daily concerns and activities to the present mystery of reality, and in a way that expresses our true spirit. One way or another, it will lead beyond ego and to the other side of god.